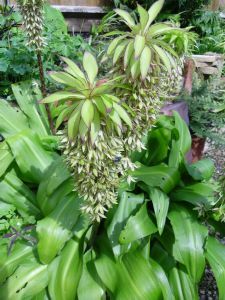 Eucomis bicolor is commonly called 'Pineapple Lily' because the flowers resemble a pineapple. This species boasts maroon-speckled stems and green flowers with maroon margins.The flowers occur on thick, solitary stalks bearing bottle-brush-like wands of tightly-clung flowers, which are crowned by tufts of green bracts.As the common name implies, these unusual and magnificent inflorescences are reminiscent of pineapples. Plant them in sheltered sunny beds or against a warm wall to protect them against the worst weather. This species is perhaps the easiest and hardiest to grow, and always attracts attention when its curious and long-lasting flower spikes appear in July and August. It can also be very successfully grown as a handsome container plant for that exotic look on the patio.